The American Gold Eagle coin is one of the best-selling gold coins in the world, with hundreds of thousands (and sometimes millions) of ounces of gold sold to the public each year. It is beloved for its patriotic design and is used by investors all over the world to protect their wealth. 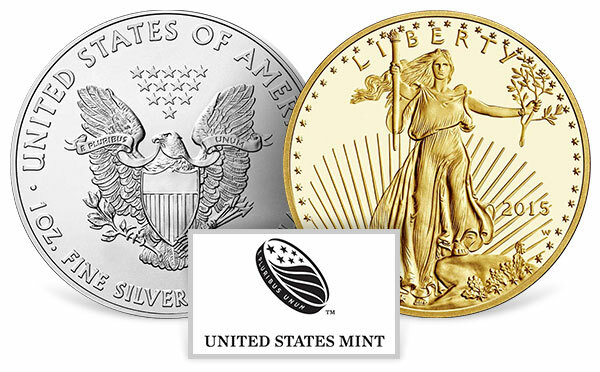 The U.S. Mint offers the Gold Eagle in several different sizes: 1 oz, 1/2 oz, 1/4 oz, and 1/10 oz. The Silver Eagle is by any measure the best-selling silver coin in the world. Each of the last two years, the American Silver Eagle has set new sales records, with more than 40 million coins (that’s over 40 million ounces of pure silver!) sold in both years. Guaranteed by the full faith and credit of the U.S. government, the Silver Eagle is the most trusted silver coin in the world. The Gold Buffalo is the United States’ first ever 24-karat (99.99% pure) gold coin. While it is a favorite among precious metal investors for this reason, it is also well-known for its iconic design (the Buffalo nickel design), which shows the profile of an American Indian man facing right. This also makes the Gold Buffalo highly collectible! Another favorite from the U.S. Mint comes from recent history: 90% silver coins. The dime, quarter, and half dollar were composed of .900 fine silver up until 1965 (i.e. 1964 was the last year these silver coins were produced by the Mint). Although this may come as a surprise to may modern observers, the use of real silver coins for regular circulation and everyday commerce was the norm during the nearly two-century history of the U.S. Mint up that point. Today, many coin collectors and bullion investors seek these 90% silver coins, occasionally finding them in their pocket change by mistake! Today, the U.S. Mint is the premier government mint in the world. Known not only for the rich symbolism of its designs but also for its use of domestically mined gold and silver for its bullion coins, the U.S. Mint is are the forefront of the international market for collectible and investment coins. When you are looking for trusted bullion products, the U.S. Mint's gold and silver coins should be at the top of the list. In addition, the active U.S. Mint facilities in Philadelphia and Denver offer tours to interested parties who would like to see what goes on inside a mint. If you’re interested in taking a tour of either of these locations, you’re encouraged to check the contact information provided below. It’s a great way to take a trip and have fun with the family and learn about the prestigious history of the United States Mint! Follow the link provided to check out How A Coin Is Made! Phone: 1-800-USA-MINT, available 7 days a week from 8 am to midnight ET. There was a U.S. Mint branch facility in Manila, the capital of the Philippines islands, from 1920 to 1941. The Lincoln cent is the only annually-produced circulating coin that features a bust facing right. The Spanish milled silver dollar (8 Reales) was accepted as U.S. legal tender until 1857. It is believed that George Washington donated his own silver flatware for the production of the country’s early silver coins. The first U.S. Mint building in Philadelphia (1792) was actually the first federal building constructed by the U.S. government under the Constitution. During the mid-1800s, there were both 2-cent and 3-cent coin denominations. The 3-cent coin, or “trime,” was issued for the convenient purchase of stamps, which cost 3 cents at the time.